Hey ClashTalkers! Who are the actors you can't keep straight because there's someone else who looks just like them? Here's mine: That's Terrence Stamp on the left. That's Malcolm McDowell on the right. (Or do I have it backwards?) 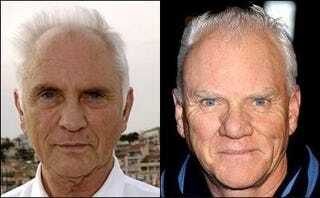 One was in Clockwork Orange and one was in The Limey but I couldn't tell you who was in which. ClashTalkers: who do you always get mixed up? Post your answers in the comments and, as usual, bonus points for pictures.